Wed., October 17, 7:00 pm. Thomson Funeral Home, 669 Broadway Ave.
Once you have a basic understanding of the process of researching your familyhistory, you will want to know where to find more information. Some of thatinformation is “hidden” on the internet.Google is one of the best tools available to find it, but getting millions of “hits”during a search is not helpful. This session will show ways to “dig out” theinformation that applies to your own specific family.Google can also help you find libraries and archives that contain information not on the internet. The key to using Google successfully for genealogy, is understanding how it works. Tuesday, October 30. 7 – 9 pm. You are invited to commemorate the Centennial of the Armistice at Camp Hughes. Saturday, October 13, 10 am – noon. 374 River Road, St Andrews. $10 registration. Historical researcher Lisa Bobbie will introduce the types of records held in archival collections containing information about Indigenous peoples in Canada. She will offer strategies on how to conduct genealogical research, locate records, and organize information. Millennium Library, Carol Shields Auditorium,251 Donald St. Phone 204-986-6450 to register. Free admission. 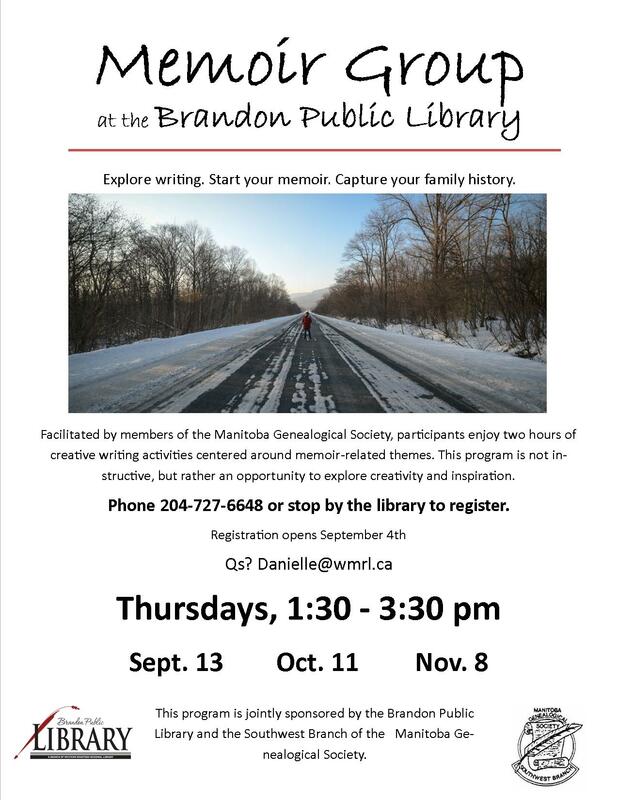 Brandon Public Library (710 Rosser Ave.) and South West Branch are hosting three sessions of Memoir Writing this fall: Thursdays: September 13, October 11 and November 8 from 1:30 – 3:30 pm. The Dauphin Branch is taking a display to the Heritage Fair on Saturday/Sunday, February 16th & 17th, 2018.